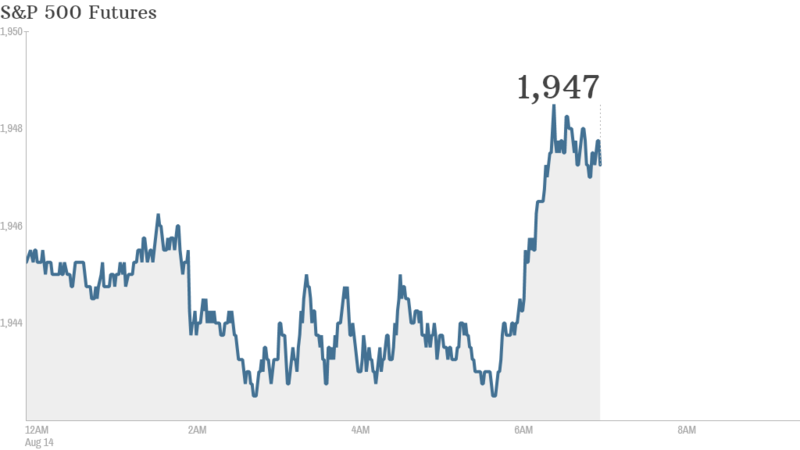 There's more bad news for the global economy Thursday, though markets seem to be shrugging it off. 1. Europe's recovery stalls: Eurozone growth evaporated in the second quarter, as Russian meddling in Ukraine helped send the German economy into reverse and France stagnated. European markets fell in early trading, before edging higher midday with U.S. stock futures. "The fear is that the economy is heading for recession once again, not helped by events in Ukraine and the potential for further sanctions to negatively impact in the current quarter," wrote Simon Smith, chief economist at FxPro. 2. Stocks to watch: Shares of Cisco Systems (CSCO) fell in premarket trading after the IT firm said it plans to lay off up to 6,000 employees, about 8% of its current global workforce. 3. Earnings and data: Retailers Kohl's (KSS) and Wal-Mart (WMT) reported earnings before the opening bell. Wal-Mart lowered its guidance because of higher health care costs than previously expected and also the need to invest more money in e-commerce. The retailer's shares dropped 1% before the bell. Kohl's reported a quarterly decline in revenue and same-store sales, but profit rose, compared to the year before. Shares jumped more than 3%. J.C. Penney (JCP), Nordstrom (JWN) and Weibo (WB), the Chinese version of Twitter, will report after the close. The U.S. Labor Department will post weekly jobless claims at 8:30 a.m. ET. 4. Wednesday market recap: U.S. stocks closed higher Wednesday. The Nasdaq jumped more than 1% and the S&P 500 was up about 0.7%. The Dow Jones Industrial Average gained 91 points, landing back in positive territory for the year.